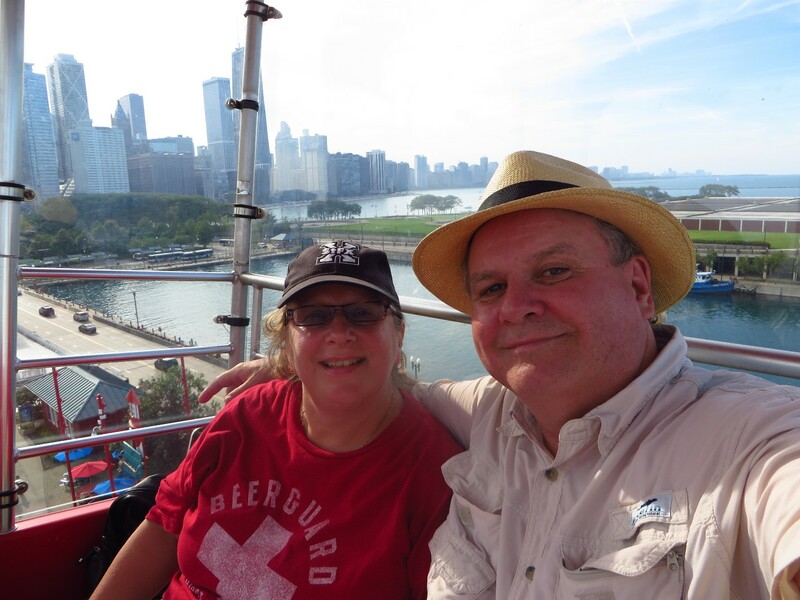 After eating and having a couple of beers at Rock Bottom Brewery Teena and I headed to Navy Pier. Navy Pier is a not-for-profit originally opened as a shipping and recreational facility in 1916. Located on Lake Michigan, it has served many purposes throughout its rich history and currently encompasses more than fifty acres of parks, gardens, shops, restaurants, family attractions and exhibition facilities and is the top leisure destination in the Midwest, drawing nearly nine million visitors annually. Teena has a love hate thing going on with Ferris wheels, so we had to get aboard this one. The view of Navy Pier from above. Inside one of the buildings were dancing fountains. I had a chat with Bob Hartley. This is a great lighthouse. Looks like somebody lived in the lower area before it became automated. Then came on one of the most sensational sunsets I have ever witnessed. It was an excellent way to start a vacation!